My friend Kate and I had tickets to a concert – my favorite, Marc Broussard – and decided to make a night of it. We both like to try out new restaurants so we searched around Midtown near the concert venue. We came across Tavernpointe and it had decent reviews so we made a reservation. Then my friend came across a Scoutmob dinner for two deal – our lucky day! If you’re a planner, like my friend and I, or just get really excited for new restaurants, don’t plan ahead for Tavernpointe. Get excited, just don’t plan ahead. They have a few staples that stay on the menu, but for the most part it changes regularly. The chef decides what looks good at that time, what’s in season, etc. and plans the menu. Pretty cool. Our deal included two cocktails – I got the Herbal Remedy and Kate got the Peaches and Peppers Sangria. The difficulty in choosing a drink from this menu is that they all have at least one interesting ingredient that makes you pause. For example, the Herbal Remedy has a green bell pepper sauce. Don’t pause too long – it was delicious. Next came the fresh rolls and herb butter, which everyone gets. No better way to describe these than simply amazing. The next part of our deal was a meat & cheese board – one meat, one cheese (I can’t remember what they were), red onion jelly (interesting and delicious), 420 beer mustard, and caramel popcorn. Lastly was an entree each. I had a risotto with two types of mushrooms, peas, and Parmesan. Kate had linguine with pork. The pasta is made there fresh every day – how often do you get fresh pasta? – but the rest of the menu looks great as well. Tavernpointe is trendy and super cozy, but not too couple-y. Great for date night, girls night, guys night, group outing. The location is a little concerning as it is not exactly in a high traffic part of Midtown – at that weird intersection of Peachtree Street and Spring Street – and is in the bottom of an office building. Hopefully they still get plenty of traffic and good reviews. But definitely give it a chance. I highly doubt you’ll be disappointed. Categories: Wonderful Wednesday | Tags: Atlanta, midtown, restaurants, Tavernpointe | Permalink. I was really excited to come across Nathan Angelo on Spotify. He’s in the same vein as Marc Broussard who is easily my favorite artist. A little soul, great vocal range, and seems to be an entertainer (though I have not yet seen him live). And his last album was recorded live here in Atlanta at Smith’s Olde Bar. It’s a small intimate venue and I’m sad I missed that performance. This video is from that performance, so enjoy and be sure catch him the next time he plays in your town! Categories: Music Monday | Tags: Atlanta, music, nathan angelo, smith's olde bar | Permalink. A Man in Full by Tom Wolfe is the most detailed and descriptive book I have read in a long time, if not ever. Wolfe uses such detail that you feel you are actually at the room in which the scene is taking place and hearing the characters talk in their deep southern accents. That being said, this also makes for a long book – just to prepare you. In fact, he uses so much detail that you could easily create a Man in Full tour of Atlanta. It would include a tour of homes in Buckhead (Tuxedo Park: Blackland Road, Habersham Road, West Paces Ferry) and Buford Highway (Chamblee) as well as landmarks (Peachtree-DeKalb Airport, the High Museum, Woodruff Arts Center & the Atlanta Symphony, Niskey Lake, Piedmont Driving Club, Georgia Tech, English Avenue). I was very intrigued when friends were discussing this book that is set mostly in Atlanta. And if someone I know recommends a book, you can bet it’s going on my reading list. It’s set in the late ’90s, after the city hosts the 1996 Olympics. What I enjoyed most about the book, other than the highly descriptive language, was the mix of historical facts and people with characters and events of the story. I like to imagine that this was the original Gossip Girl – the book is released and high-society Atlanta goes into a frenzy speculating about who each character is actually based on. It’s also fascinating, or maybe incredibly sad, that you can’t tell this book was published 17 years ago. The issues it covers are not too different than issues you see all over the news today – race relations, sexual assault, class inequality, bribes, questionable politics. There is a wide range of characters and you develop strong feelings (positive, negative, sometimes both) for all of them. I highly recommend this book, especially if you’re from the Atlanta area or have been in the area a while. Categories: Turn the Page Tuesday | Tags: Atlanta, fiction, Man in Full, reading, Tom Wolfe | Permalink. I’m on a roll so far in 2015: #11 on my 30 before 30 list is complete! A friend was in town for new years, we were awesome and ran a 5K on the 1st, then we slept in on the 2nd. My apartment unfortunately had some water leaking/damage while I was gone for Christmas, so I have done no grocery shopping and my apartment is in disarray while they dry it out then repair it (still waiting…). So….long story short – we had to go out for lunch before she left town and I somehow thought of Highland Bakery, which I had never been to (sad for an Atlantan, I know). 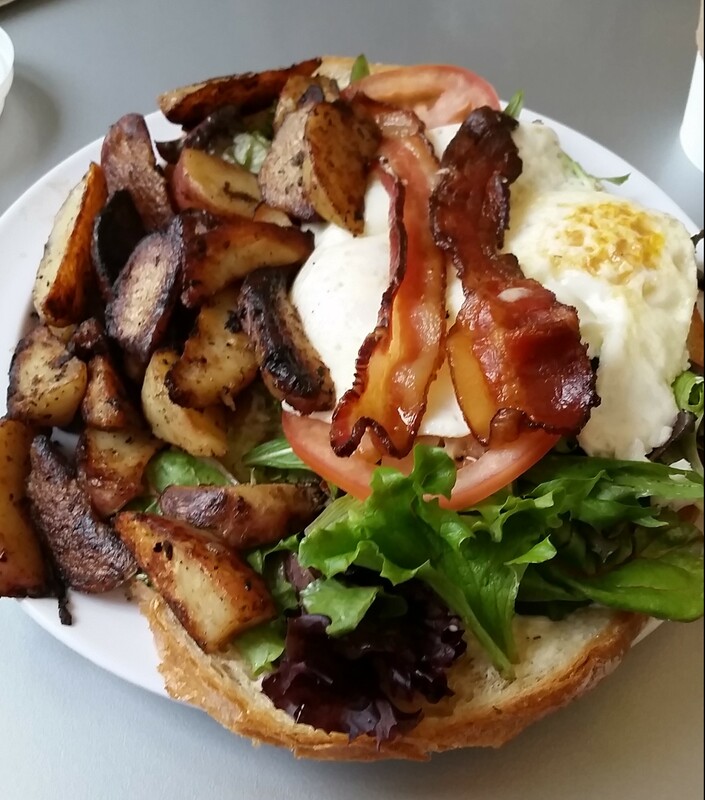 I had the breakfast BLT – yum. Open-faced, fresh greens, bacon, tomato, and over medium eggs. It was a complete mess to eat and it was delicious. I highly recommend Highland Bakery and they have 5 lovely locations to choose from (we went to the Midtown location – complimentary valet but not a ton of seating)! Categories: Sunny Sunday | Tags: Atlanta, food, Highland Bakery | Permalink. The second restaurant I made it to before the holidays was Table at Ten in the heart of Midtown. ScoutMob has some great deals for brunches and dinners for 2 and is an easy way to make yourself try a new place. This was no different – brunch for 2 at Table at Ten was perfect for a little pre-Christmas get-together for my friend of 27 years and I. They had a very good and unique menu. We started with some mimosas and took our time deciding what to order. My favorite brunch food is benedicts, so I went with Florentine Benny with fresh veggies and a perfectly poached egg. Recently most of the benedicts I’ve ordered have overcooked poached eggs, so it was nice to get one cooked correctly. My friend’s order took the cake though: chicken-n-waffle sliders. Crispy chicken and candied bacon between mini waffles, with syrup for dipping. Of course I had a bite and it was just as good as it looked. There wasn’t a crowd or even a wait (though it was a dreary Saturday), so check it out on the weekend if you want a new delicious brunch! And for me, just one more new restaurant to try to check off another 30 before 30 item! Categories: Sunny Sunday | Tags: 30 before 30, Atlanta, midtown, restaurant, Table at Ten | Permalink. I’ve almost (finally) been to 10 new restaurants! I knocked off a couple more visiting my close friends before I left town for the holidays. We were heading to Decatur for a concert and obviously had to grab dinner there since there are so many great restaurant options in Decatur. Victory Sandwich Bar is one everyone loves – though Decatur is its fairly new home. The first order is always a beverage. Victory is known for their adult slushies – the one to get is the Jack and Coke slushie – and it was delicious. The sandwiches are a little smaller so you can order two, and I got the Tea Bird and a veggie one that is not on the current online menu (ha). The Tea Bird is chicken and ghost pepper jack which has a real kick to it – more than just mild kick. The veggie had a portobello, tomato, I think spinach and some kind of spread. They were both delicious, as were the chips. Definitely recommend Victory and a stroll around the square in Decatur. Categories: Tickled Tuesday | Tags: 30 before 30, Atlanta, decatur, restaurant | Permalink.